If your goal is to be a likeable person, these 6 points are for you. The book that Dale Carnegie put together, and the one the Buffett read and gives reference to is How to Win Friends and Influence People this classic, first published in 1936, has sold over 15 million copies and contributed to the rise of many famous individuals. Most of us will immediately recognize the single sentence summarizing the first chapter, “Never criticize, condemn, or complain.” Yet, I for one struggled to recall all six of the ways to make people like you from section two of the book. Central to success in dealing with people is their ability to tolerate or their enjoyment in interacting with you, and these six points have a great deal to do with making one a more likeable person. Despite reading the book several times over the past few years if you were to ask me what the 6 ways to make people like you are, up until now I would have had a hard time remembering them. I put together a list of 6 keywords all beginning with “S” and hopefully it helps you remember them like it has helped me. Be genuinely interested in the other person. Carnegie uses the everyday example of a dog because a pooch doesn’t have any ulterior motives or wants to get anything out of you. They are genuinely happy to see you. This straightforward approach is the most innocent tactic you can use in dealing with others. Remember, the sweetest and most important sound in any language is that of the other person’s name. This keyword serves a double purpose, the first being that people like to hear their name and when you use it when you are with them they appreciate you for it. The second is that when trying to remember names it is extremely important that you get the cadence and the sound of their name correctly in your mind. If you simply let the pronunciation of their name wash by you when they introduce themselves, you are unlikely to get it correct later on. Certain people are more prone to overtalking than others, but in general, when in conversation you can practice generosity by letting the other person talk more. Cultivate the art of listening well! Listening is much more than only not talking, but that is outside of the scope of this point, you can read a great section on “empathic listening” in Stephen Covey’s bestseller, 7 Habits of Highly Effective People. Most of the time I don’t favor special interests, but in this case what I mean is that your interests should reflect those that the other person holds when you talk with them. As they talk about things that they are comfortable with, the walls begin to recede and the capacity to relate is strengthened. If you are passionately interested in building houses out of cards, but the other person is into dirt-biking, ask them more about dirt-biking! You might learn something interesting. When you deal with others, remember that one of the base desires of individuals is to feel important. This need is insatiable and will be filled either in healthy ways or unhealthy ways. If you motives are pure, you can give others a feeling of importance and they will love you for it. You can make someone’s day or even week by sincerely giving them a feeling of importance. In some cases that becomes a touch-point of their self-identity, and you, by doing something that could have been an off-hand remark changed a bit of that person’s self image. I remember several times throughout my childhood on the family farm my father put me in situations where I knew that he was trusting me with something important. I remember driving a truck from one farm to another at 12 years old (very illegal, do not recommend) and I felt like a man. My parents let me drive by myself to Wisconsin from Michigan at 17 and I loved it. Things like that built my own sense of capability and I hold those experiences of responsibility to this day. Warren Buffett said that the Dale Carnegie course changed his life, judging by his results, it seems like it did. If so, you’re experiencing a difference in personality that manifests itself in different ways based on several different things in that “odd” person’s nature or nurturing. Everyone is created unique, and yet as a whole, people are predictable. There are four main temperaments which each person has to a greater or lesser extent. You definitely have an extremely unique blend of these four temperaments but the single traits that you choose to embrace can also be observed in many others, leading those who understand the four temperaments to make roughly accurate predictions when dealing with others. We will briefly touch on the four personalities, and then dig into a couple things on how to deal with others. If you have ever wondered why you’re the smartest person in the room and everyone else is acting dumb… you’re probably Choleric. 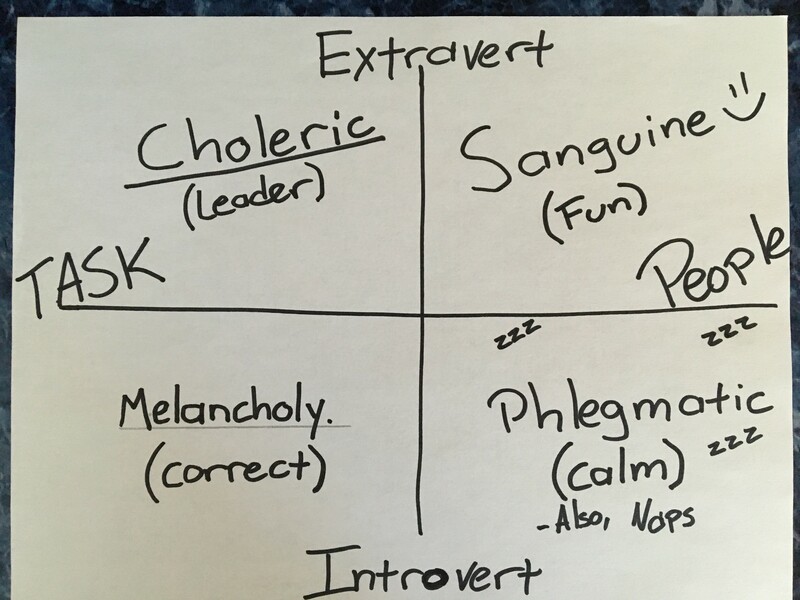 The Choleric individual is out-going, task oriented and can always be happy if other people would just figure out that she needs everything done her way… NOW. They are happiest when they are getting results. If you’ve ever had a hard time remembering what someone else literally just said to you because you were singing a song in your mind… you’re probably Sanguine. The Sanguine personality is constantly upbeat, forever singing, dancing the night away, enthusiastic about everything, and maintains a childlike innocence throughout their life. They will always be on the lookout for the next thing to do, and wear their emotions on their sleeve. They are happiest when they are having fun, in fact they don’t do anything willingly unless it has an aspect of fun in it. If you’ve ever rolled your eyes and compulsively changed the toilet paper roll in someone else’s bathroom so it would be on “the right way” … you’re probably Melancholy. These individuals are the smartest, most meticulous, people you will ever meet. If you are of this personality, you find yourself in the company of the greatest geniuses of history who disciplined themselves to adhere to perfection. You are happiest when you are getting quality answers, when things are in order, and when you are correct. If you don’t know what it means that a toilet paper roll could be on “wrong” or if you haven’t figured out what personality you are yet… you are probably Phlegmatic. These individuals are the most relaxed of all the temperaments. If you are a phlegmatic person you enjoy rest, it’s not uncommon for people to enjoy being with you, but at the same time you could be fine on your own. It’s a great day for you if nothing crazy happens, no arguments happen and you’re able to relax. You are happiest when everyone is getting along. Take what you will from these headlines, they can be applied in various different ways. Sanguine – I grew up with a buddy who would exaggerate, I could never figure out why it was that he would lie to everyone about what he had done. Then when learning about personalities I realized I wasn’t friends with a pathological liar, I just had a sanguine for a buddy. Phlegmatic – I naturally have quite a bit of this personality in myself and I can attest to the helpfulness of the suggestion in the book that phlegmatic individuals should start by forcing themselves to get enthusiastic about one thing a month and work up from there. Hope you enjoyed this brief overview! Feel free to reach out to me to continue the conversation, this is one of my favorite topics.